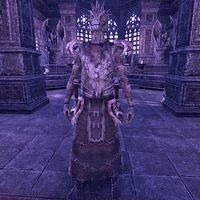 Reezal-Jul is an Argonian necromancer working as Baron Wylon Montclair's personal advisor. He is responsible for the death of many in Rivenspire, more specifically the settlement of Crestshade. Prior to this, he worked for King Ranser as his court mage. Reezal-Jul: "I have no time to deal with these fools. Kill them. Kill them all!" When you first properly meet Reezal-Jul, he is fruitlessly working on medicine for Baroness Leila Montclair's ailement at the Baron's behest in Verandis's memories. "This is hopeless! Baron Montclair forces me to mix concoctions that I know won't do any good. If he'd just listen to me, I could show him exactly how to heal his wife and end her suffering." "I am talking about knowledge and ancient magic. I am talking about the forgotten arts of the Ayleids themselves. Would you deny our lady any chance for a cure, no matter what the source?" I want to see the Baroness healed with all my heart. "I happen to possess an Ayleid relic—or at least a shard from one. But the Baron won't listen to me, especially since our lady started refusing my help. If I give you this stone, will you present it to the Baron? He listens to you, my friend." Get the shard. I'll convince Wylon to use it. Reezal-Jul: "The stone reacts differently to you, Count. How remarkable." "Fascinating, isn't it? To think that such a tiny rock could hold so much power. Can you feel it? It's like it's calling to me. Like the moons call to the tides. Imagine what the relic it came from could do!" Why didn't you give the stone to Montclair? Why have me do it? "The Baron wasn't listening to me. We needed. We needed someone he trusted more, had more faith in. That someone was you, Count Verandis. Now the Baroness is on the mend and House Montclair has returned to a state of contented bliss." The stone isn't enough. Leila is still sick. "Well, that's unfortunate. But it is only a small piece of a grander relic, isn't it? I've been studying the Ayleid manuscripts. There may be more we can do for the poor Baroness." Spit it out, Argonian, and speak plainly. "The manuscripts are locked away, but I left my notes in your library. A few phrases stood out as I translated—Life, Death, Crag. I'm sure they mean something. Take a look and see what you think. Perhaps the text can lead us to a greater relic." During the third memory, the Montclairs are climbing the Doomcrag. Reezal-Jul says a few things during the ritual they perform on the remnant. Reezal-Jul: "Feast, my children! Feast on bones and blood!" Reezal-Jul: "Arise, my children! Attack!" This page was last modified on 21 February 2019, at 22:52.